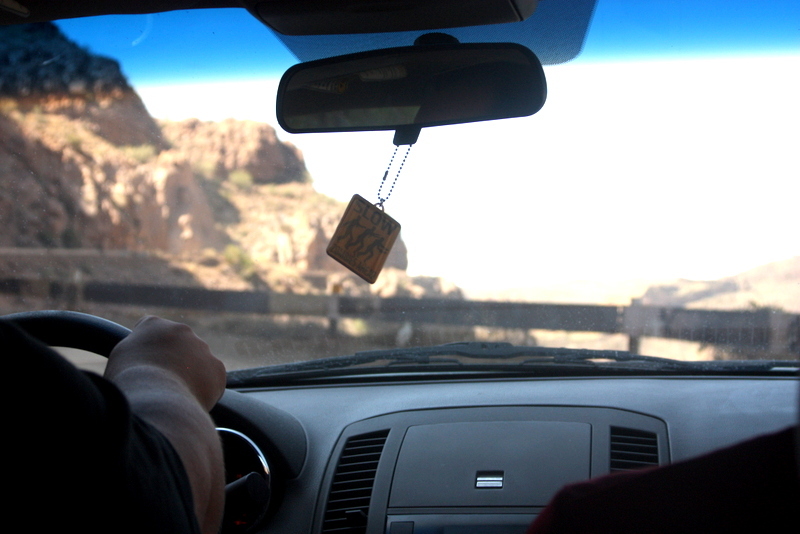 One of the most fascinating, adventurous, breathtaking, and at points scariest things I did while in Phoenix was drive the Apache Trail. 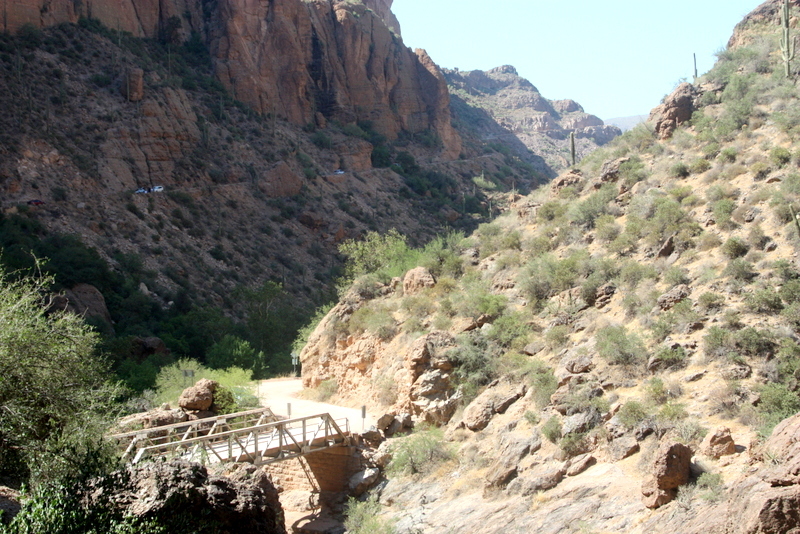 Now, if you’re unfamiliar with the Apache Trail, it’s an old route that was taken by the Apache Indians and stretched from out in the Superstition Mountains southeast of Phoenix into Phoenix itself. It winds back and forth carving its way through the rugged Superstition Mountains. As an aside for those curious about the naming of the Superstition Mountains like I was, they are named primarily because of the tale of the Lost Dutchman. 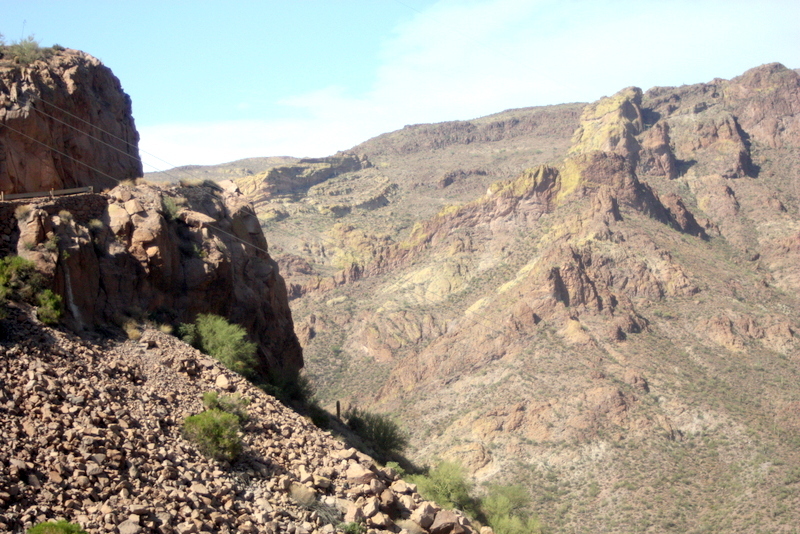 According to legend, gold miner Jacob Waltz ventured out into the Superstition Mountains and found the mother lode of gold. On his death bed, he revealed the location of his prized gold mine to the woman who was taking care of him. However, his mine has never been found, even though other mines have been in the area. Another tale is that the Apaches believed that the mountains contained a hole leading to the underworld, and the winds that blew from it caused dust storms, much like the one I experienced while in Phoenix. 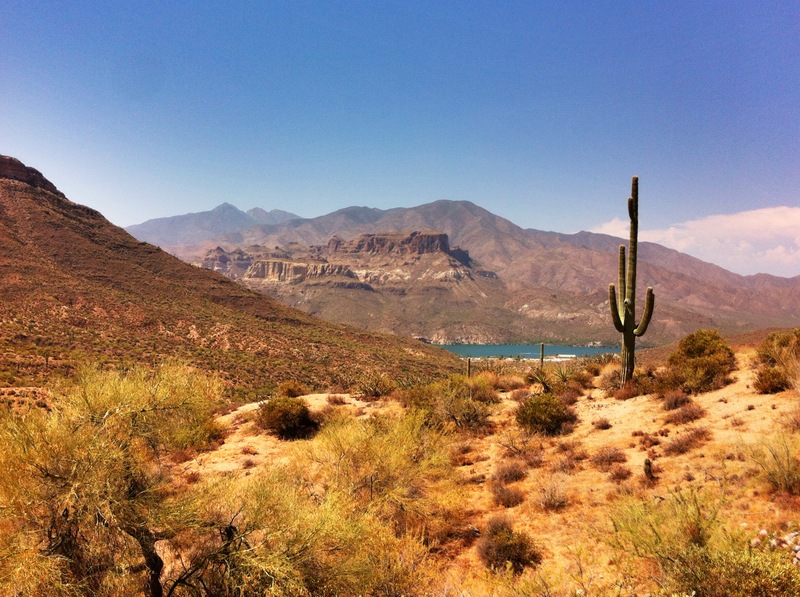 We drove the trail because walking in the 110°F heat would have been just about unbearable. Although, it didn’t stop me from stepping out of the car and working up a sweat hiking around getting some great snapshots along the way. Over 600 pictures. Oops! Other then the heat, I may have preferred walking the trail because the one lane, gravel roads with minimal, and may I stress MINIMAL guard rails were not my favorite sitting in the back passenger seat with no control of the vehicle itself. I think I just trust my own to feet more then the right foot of another driver and the vehicle’s breaking system. The trail itself winds out from far east metro Phoenix in Apache Junction and begins as a gently rolling road through Lost Dutchman State Park but soon begins to wind its way up through the mountains with hairpin turns and quick switchbacks. 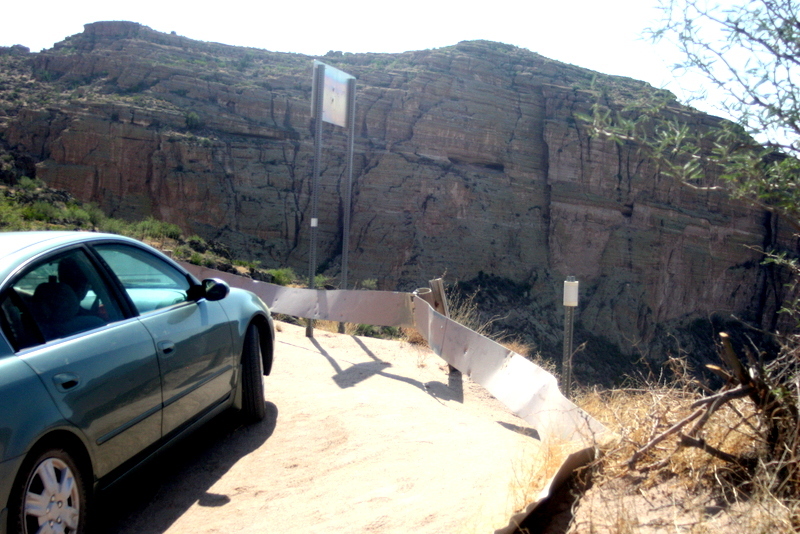 However, this part is not too bad for those not too inclined for steep cliffs with blind, sharp turns. The roads here are two-lanes and paved, and the guard rails are, well, guard rails that you will see along many interstates and highways in the United States.This part of the drive yields wonderful views of the mountainous region and polarized ones of Canyon Lake, a dammed up manmade lake in the Salt River, that contrast the mirage-like blue lake with the brown, dry southwestern desert surrounding it. Here begins the adventurous, nerve-wracking part of the drive where you may want to consider turning back if your car is unprepared for gravel road travel, your driver is gutting tired, or your palms are already sweaty. As nervous and anxious as I was, I knew we couldn’t stop and I had to see what lie ahead. Needless to say, the incessant pushing of my right foot into the floor of the car was worth it. The views, scenic as they were on the first part of the trail, were even more stunning on the other side. The steep drops got steeper, the canyons got grander, and the rock formations even more elaborate. It truly felt like the wild, wild, west, minus the Nissan Sentra we were in. That may in fact be a little cliché, but after driving just about an hour and a half out of Phoenix, we were so far removed from civilization that’s what it felt like. And nerdy as it may be, I liked to imagine I was traveling across the land for the first time, starring out at all these mountains and wondering which way I would take the move through them and beyond them. THAT would just about be my dream adventure. bear Grylls style. You can see the sharp drop off where the road is on the left side on the picture. Not much safety, huh? Also, the road goes from a comfortable two-lane road before Tortilla Flat to a one to one and a half-lane road on the unpaved, gravel section. 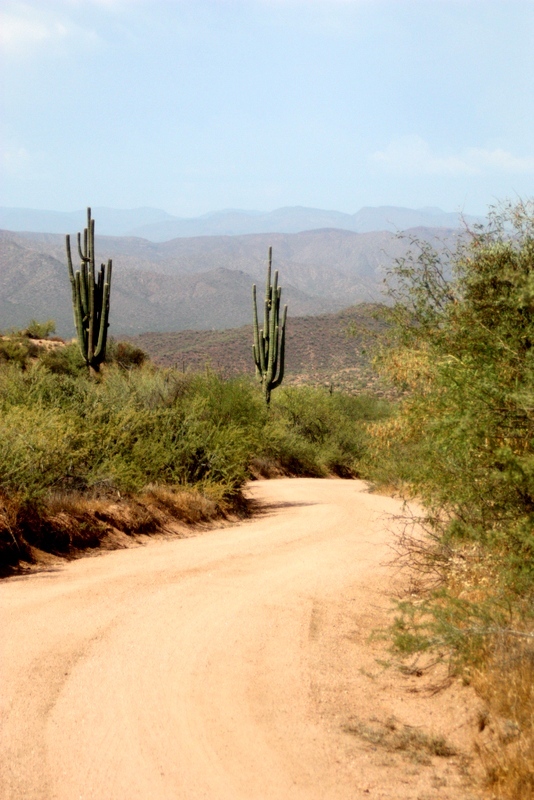 Therefore, if you choose to venture ahead on the unpaved part of the Apache Trail bear in mind that you cannot simply turn around at any point. There are a select few pull-off areas where turning around will be easy. Otherwise, it’s onward and…downward? Well, this is the case when you hit Fish Creek Hill. 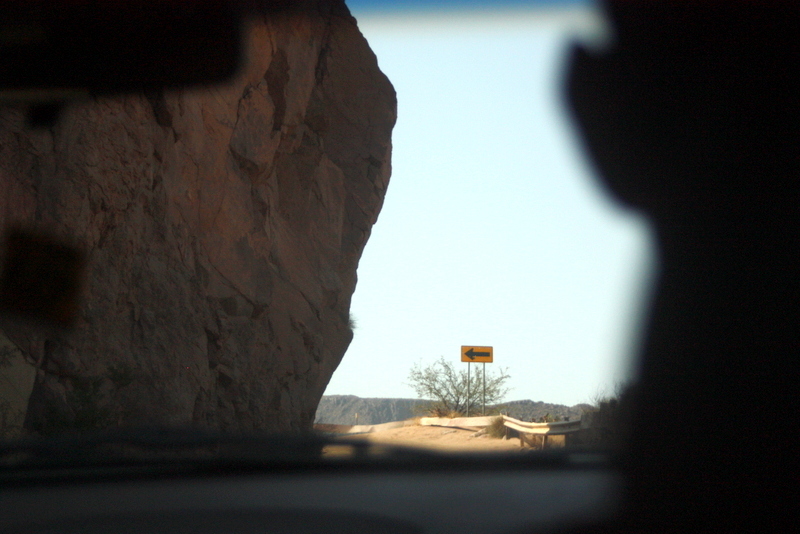 The largest, steepest, most fright inducing, and most scenic parts of the Apache Trail. This hill is considered by many to be one of the most dangerous roads in America. Once start down you cannot turn around until to reach the bottom by the Fish Creek bridge, which has a pretty cool cave you can hike back to (Hint, hint!). The trail continues winding from there on to Roosevelt Lake. You can see cars coming down the one-lane road on the side of the cliff. The bridge is over the now dried up Fish Creek. 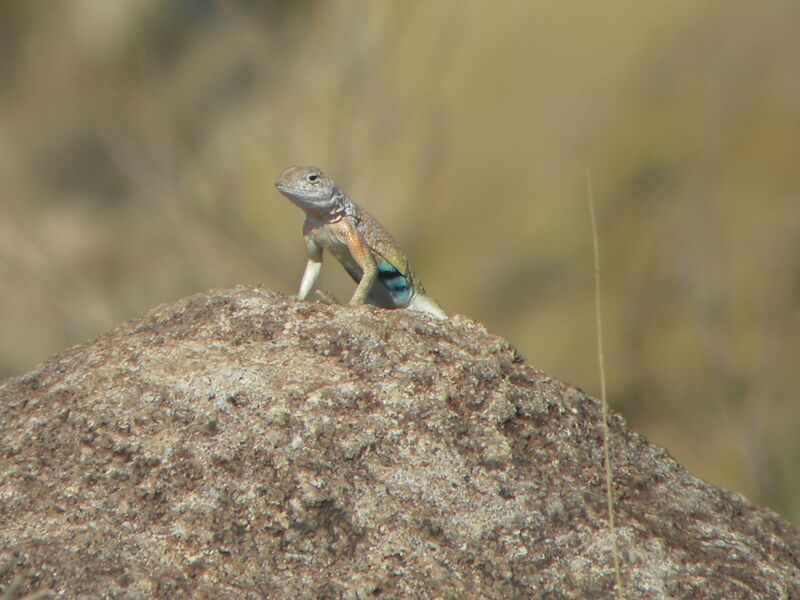 Found this little guy on the trail too! We only made it as far as Saguaro Lake due to time constraints, as we had dinner plans. The trip to there took us about 2.5 hours from around the Tempe area, and we certainly did not drive fast around those hairpin turns because a certain someone (see: me) kept inserting, “But serious Dough, drive slower,” into our otherwise rousing conversation. I just wanted to take in the views longer, right?! The road, while not too long distance-wise, takes time to travel due to the treacherous conditions. If you drive safe and smart, you will be rewarded with stunning views of the outstanding beauty the American Southwest has to offer, but remember to be careful as people have unsuccessfully tested the guard rails before. 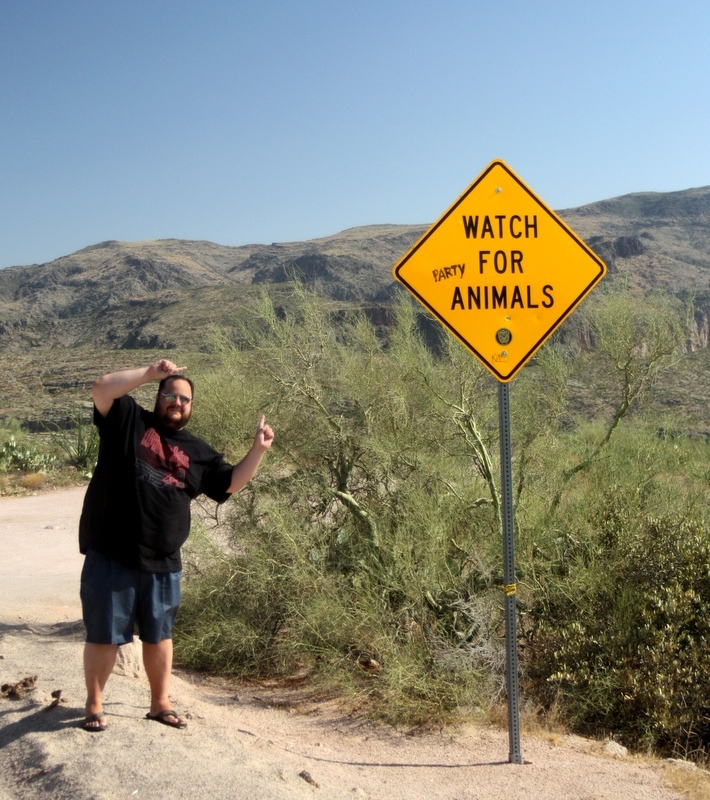 I’m not trying to scary anyone off because the Apache Trail can be done safely. I just would have to have someone venture further into the trail then they felt comfortable doing. 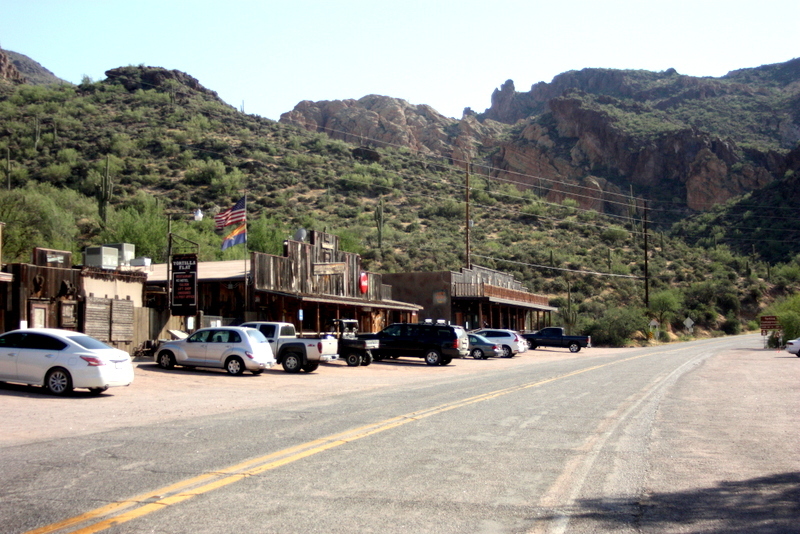 However, it’s my recommendation that you do the Apache Trail, or at least past Fish Creek Hill, so you can take in all the superb scenery and eerily quiet sounds of Superstition Mountains. And maybe have my nerdy daydream experience of being an early explorer lost in the wild west. 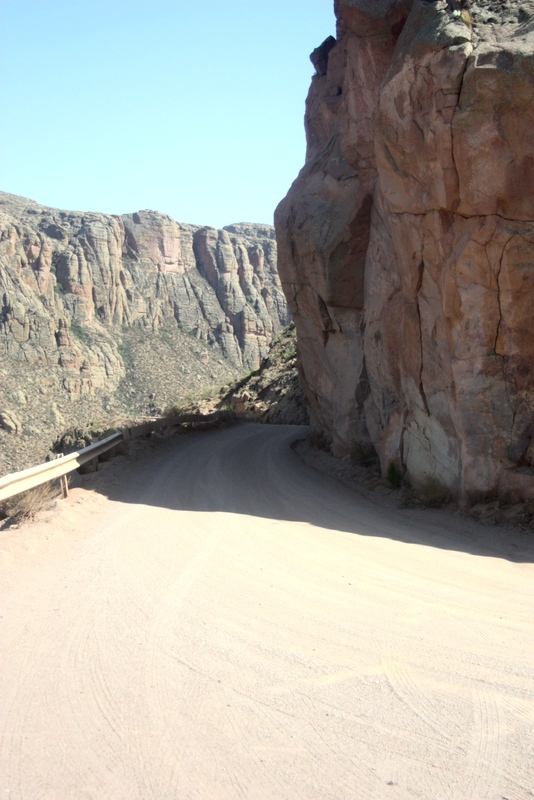 Have you ever been on the Apache Trail or any other dangerous roads? What were your thoughts on the drive? This looks really cool! My mom and step-dad recently moved to the Phoenix area, so this might be fun to do next time I visit them. Although I’d probably prefer to walk it, seeing as I get carsick really easily! It was a really cool drive! I think you’d be fine if you drove out to Tortilla Flat and then a little bit beyond where the gravel road starts to the first rest stop/pulloff. After that it gets pretty scary. I’m also jealous your parents moved to Phoenix. My dad and step-mom are considering a move to Florida, but I’d rather have them be in Phoenix for selfish reasons obviously.